For years, “tax-free online shopping” has brought customers to the web in droves, all while raising the ire of brick-and-mortar retailers claiming an unfair price advantage to sellers offering prices free of sales tax. At the center of these debates lies the small to medium business, attempting to navigate changing sales tax requirements, and facing increased scrutiny under these new rules. Sales tax compliance is becoming a sticky wicket, as state and local governments revise tax laws to increase revenue, and Congress considers granting states the authority to make remote sellers charge sales tax. 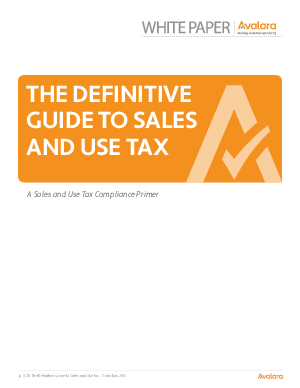 This Definitive Guide lays out sales and use tax basics as well as commonly misunderstood elements of sales tax compliance, to provide you a one-stop reference for all things sales and use tax related. The last two sections include a state-by-state summary of sales tax rules and regulations, and a glossary of terms.